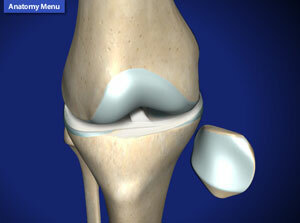 When learning about the knee, it is advantageous to understand knee anatomy first. The knee anatomy is comprised of bones, ligaments, tendons, menisci, and cartilage. 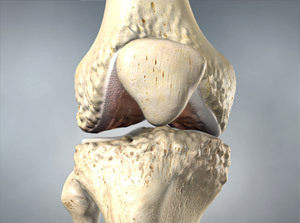 The bones that make the knee include: the thigh bone (femur), the lower leg bone (tibia), and the knee cap (patella). 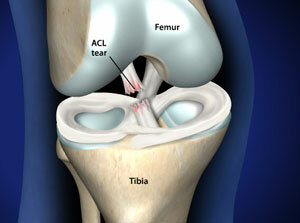 The ligaments of the knee that help with knee stability include the ACL, the PCL, the MCL, and the LCL. The tendons of the knee that help with movement include the patellar tendon, the quadriceps tendon, and the hamstring tendon. The cartilage of the knee is the white glossy coating on the ends of the bones that provides a smooth gliding surface for joint movement. The menisci are the two c-shaped cushions in between the femur and the tibia. Any one of these anatomical structures can be damaged through traumatic injury, repetitive overuse, or through the wear and tear of life. Many knee conditions can be treated properly and successfully without surgery. These treatments may include Protection, Rest, Ice, Compression, Elevation (PRICE), bracing, physical therapy, injections, and medications. Sometimes surgery is necessary to eliminate pain, restore strength, stability, and movement, and to prevent further breakdown of the knee. The knee anatomy is complicated, being the largest joint in the body, and one of the most easily injured. It is made up of four main things: bones, cartilage, ligaments, and tendons. Head over to OmahaShoulder.com to learn about Shoulder Anatomy.